Let's create front end servers! 1. Prepare 2 servers, exfe01 and exfe02 using windows 2003 standard R2 base machines. You don't need any shared SCSI disks. Both machine will use "Local Network" virtual network. 2. 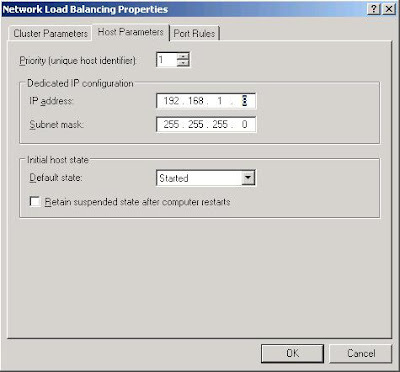 Install exchange 2003 standard server (you can use enterprise edition for this lab) on each exfe01 and exfe02 (just run the "Run Setup Now"). You don't need to do domainprep or forestprep. 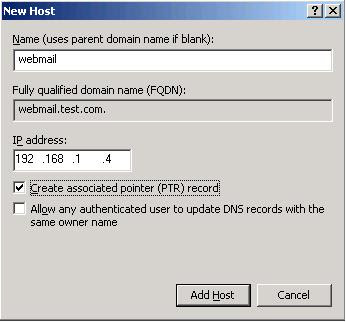 Don't forget to install IIS, ASP.net, NNTP and SMTP before you install exchange servers. 3. From EXBE01, open Exchange System Manager. 4. Right click the EXFE01, and select "This is a front-end server", OK, and reboot. 5. Do the same on the EXFE02. 1. Login to the EXFE01. 7. Ok on the warning window. 8. 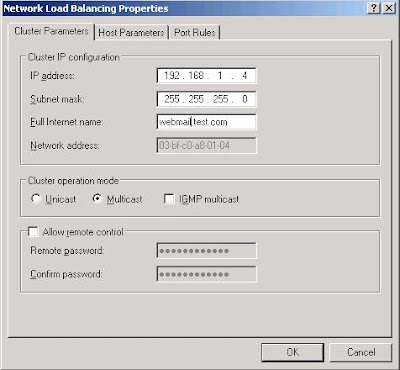 Open the "Internet Protocol (TCP/IP) Properties. 11. Open the IIS manager, open the default website's properties. 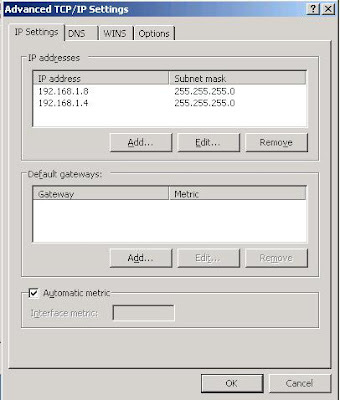 12. change IP address to 192.168.1.4 and OK.
Test the NLB front end server. 4. From the DC, open OWA by webmail.test.com/exchange. If you don't want to manage dns, just type 192.168.1.4/exchange to access the OWA. Turn off one of the front end server and try to access the OWA. You just created NLB exchange front end servers.